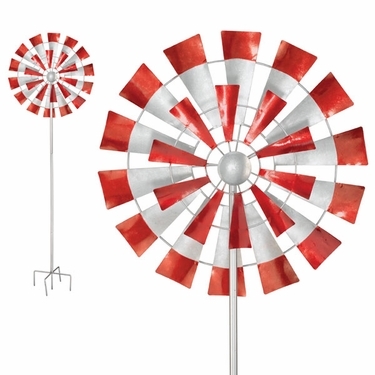 Bring a cherished symbol of American tradition to your garden and farmland with the classic design and colors of our new 26" Metal Kinetic Windmill Wind Spinner! We love large wind spinners and we are thrilled to offer these new colorful designs that actually spin! Watch our 26" Double Spinners in Action! This handcrafted metal spinner has been reinforced with a high quality and durability design. Stainless-steel bearings with super strong iron bearing casing to keep thick blades attached, large durable ball bearings for the best spinning action, extra thick and strong pole and ground stakes! Painted in vibrant metallic paints that glisten in the sun and dazzle as they spin. This new kinetic stake will blow you away! The unique double-bladed design spins the sails in opposite directions, creating a mesmerizing effect. Firm 5-prong ground fork stake bottom for heavy duty stability. Size: 77.5" Tall, 26" Spinner, all Metal. Stainless-steel bearings & strong iron casings. Double-bladed design spin in opposite directions.